With five days left to the midterm elections, candidates for governor and U.S. Senate are blanketing Wisconsin as part of a final push to Tuesday. Republican Senate candidate Leah Vukmir was campaigning with U.S. House Speaker Paul Ryan and Gov. Scott Walker on a bus tour from Waukesha to Green Bay. 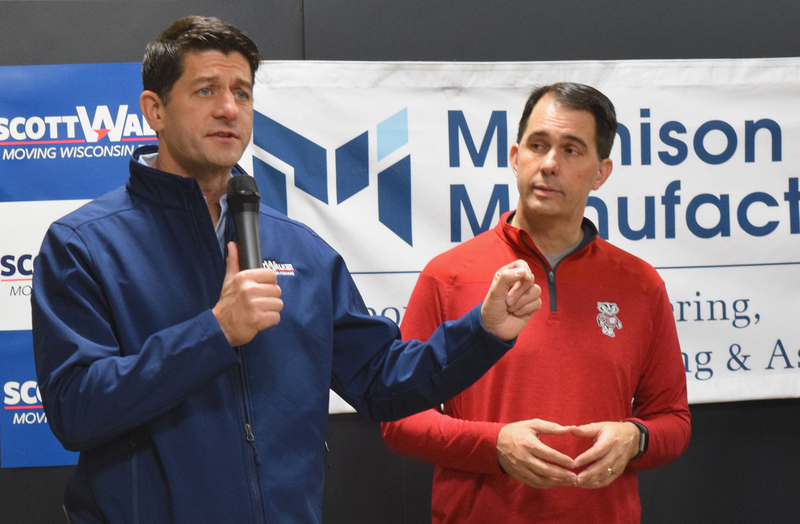 At their first stop in Waukesha, Ryan rallied Republican voters and talked about how GOP policies at the state and federal level have bolstered the economy and cut taxes. "We're excited to see the success that these good policies have had, but part of the problem is we have people that have not been helping in this," Ryan said. He accused Democratic U.S. Sen. Tammy Baldwin of failing to help enact economic policies, essentially canceling out Republican U.S. Sen. Ron Johnson's vote. "It wasn't that long ago where we had high unemployment, where we had deficits, where we had all of these problems," Ryan said. "Scott Walker looked at Wisconsin's problems and he said to Wisconsinites, 'Here is an agenda to fix these problems, if I get elected, I will do this.' Well, he did just that." Walker, Vukmir and Lt. Gov. Rebecca Kleefisch accused Democrats of wanting to raise taxes and promised they would protect those living with pre-existing conditions if the Affordable Care Act is repealed. While national issues were at the center of the visit, Ryan and the GOP candidates kept their distance from mentioning President Donald Trump — although Vukmir referenced him once. Instead, Walker said he was focused on Wisconsin issues. "From our standpoint the things we talk about are the things we actually hear from people," Walker said. Later Thursday, Vukmir was supposed to campaign with presidential counselor Kellyanne Conway in Appleton, but "unforeseen mechanical aircraft issues" forced Conway to postpone her visit, a Vukmir press release stated. In the statement, Conway said Vukmir is the ally Trump needs. "President Trump needs an ally like Leah to continue the recent economic boom; improve access, quality and affordability of healthcare; and increase the respect and resources for our military and veterans. We must stop out-of-touch liberals like Tammy Baldwin, who radically plans to raise our taxes, outsource our jobs, and destroy Medicare, Medicare Advantage and employer-based insurance for 3.4 million Wisconsinites. As a nurse, Leah has cared for and listened to her patients, and is committed to help all Wisconsinites," Conway said. Democratic candidates also hit the road Thursday to burgeon voter enthusiasm in the week before the election. 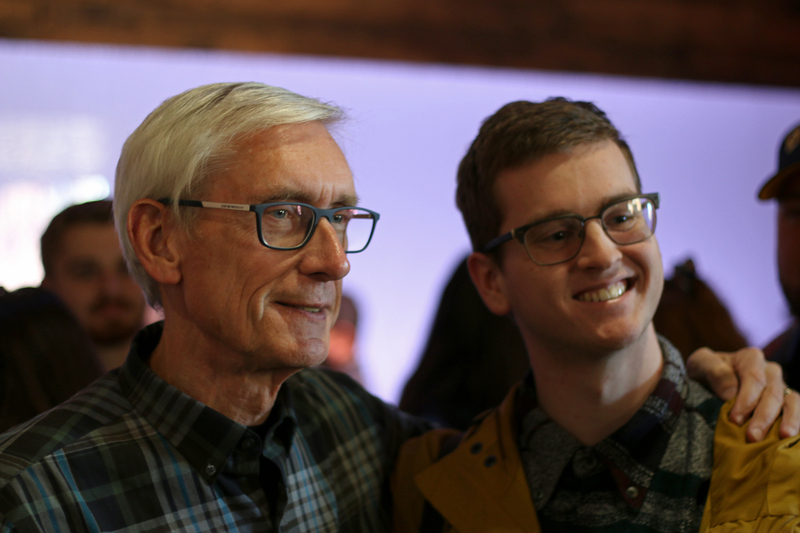 Democratic gubernatorial candidate Tony Evers is on his own bus tour through western and northern Wisconsin — making stops in several places, including Eau Claire. Talking to students at the W.R. Davies Student Center at the University of Wisconsin-Eau Claire, Evers highlighted the importance of putting resources into education. "We’re going to start valuing the professional. We’re going to make sure that teachers have a voice in the classroom and making sure that they’re involved in the decision making process in their schools and we’re going to have a budget that gets us to where we should be," he said. He also asked attendees to go to the polls and encourage at least five other people to vote as well. "If every one of you make that happen, we will win. If Chippewa Valley goes for me and Mandela and the other Democrats, we will win. But most importantly we’re not winning for the Democratic party, we’re winning for our teachers and others across the state of Wisconsin who value the same things we do," Evers said. After the event, Evers spoke to reporters. Asked what the race will come down to in the final days, the state superintendent of schools said: "It’s all about Wisconsin values. It’s all about the things people care about whether it’s our roads, education system, health care. Those are not owned by Republicans or Democrats. It’s owned by the people of Wisconsin. I look forward to uniting this state in a way that it hasn’t been for eight years." Baldwin was campaigning in Marshfield, Mauston and Madison where she planned to cast her ballot. After her first stop in Marshfield at the Felker Brothers Corp., Baldwin spoke with reporters about trade, immigration and the latest Marquette Poll. "I think we need better trade deals not trade wars, and I am certainly concerned about the impact of the current steel and aluminum tariffs on our dairy farmers where they’ve gotten retaliatory tariffs targeted," Baldwin said. "I agree with the president in wanting to renegotiate NAFTA. I’m still examining the new U.S., Mexico, Canada trade agreement. I think there’s some positive steps forward in it. I also have some questions about some of the enforceability of the language." The senator said the current immigration system is broken, pointing to Trump's child separation policy. "When we see what we’ve seen recently of children being snatched from parents and held in cages that’s wrong also," she said. "Let's not make this a political issue. Let's get to work and fix a broken system." The latest Marquette University Law School poll released Wednesday found Baldwin garnered an 11 point lead over Vukmir. When asked about the lead, Baldwin pointed to polling during the 2016 presidential election that favored candidate Hillary Clinton. "Just two years ago we had polls that weren’t exactly the end result. So, we’re just going to keep reaching out to folks across the state. I’m in day six of a "working-for-you" tour in our rented RV," Baldwin said. The Marquette poll found the race for governor is in a dead heat among likely voters, with Walker and Evers each drawing support from 47 percent of those surveyed. Editor's note: This story was updated at 2 p.m. Thursday, Nov. 1, 2018 to include information from Tammy Baldwin's stop in Marshfield. WPR's Ximena Conde and Rich Kremer contributed to this report.